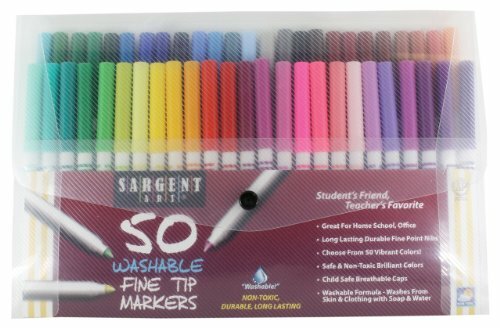 Sargent Art 50-Count Fine Tip Washable Marker Packs are great for illustrating, writing or outlining. Range of 50 colors come in a resalable plastic carry-case with handle. Markers wash easily from most fabrics and skin with soap and water. AP Certified non-toxic. This pack of markers makes an amazing addition to add to anyone’s collection. They are perfect for smaller children due to the price, durability, and the ease of which the markers wash off skin and other objects. They are also great for the adults like me who have become absolutely besotted with adult coloring books and posters. The variety of the colors, the price, and the excellent way they allow you to make your very best masterpiece make this a must have buy! For the price, the number of markers, and the fact that they are excellent to color and draw with, This deal can’t be beat. I got two packages. One for me and one for my 15 yr old daughter and 3 yr old granddaughter to share. They come in a handy case so you can transport them easily for the days when coloring and drawing in the park is a must!! Let’s go color!! This is a good deal on these. I love that they are washable! That means you can clean up the mess, lol. But for a pack of 50 this is a very good deal.